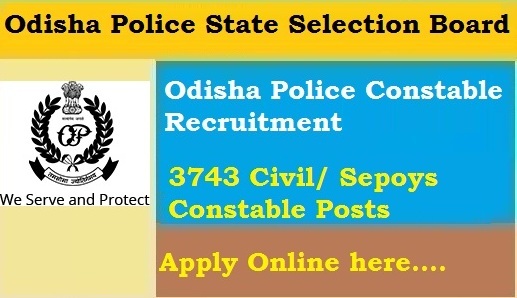 The government of Odisha has released the notification of Odisha Police Recruitment 2018for the posts of Civil Constable and Sepoy/Constable. 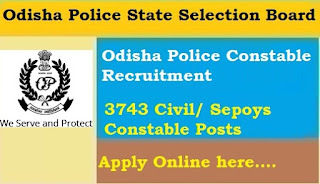 Candidates can apply for the job of Odisha Police 2018 if they meet the eligibility criteria. There are total 3743 vacancies against which interested and eligible candidates can apply by submitting their application form. The application form of Odisha Police recruitmentcan be filled in offline mode only. Candidates are advised to submit their application form before the last date. Odisha Police 2018 vacancy details can be checked by candidates from the table given below. A candidate who is interested in filling the application form should meet the eligibility criteria. Candidates are advised to read Odisha Police notification 2018 to know about the eligibility criteria in a detailed manner. The applications of non-eligible candidates will not be accepted. Candidates have to satisfy the conditions such as Educational Qualification, Age, Physical Standard, Medical Standard etc. Female candidates are not eligible for the post of Sepoy/Constable. The essential qualification can be checked by candidates from below. Candidates should have passed Class 12th from a recognized Board. The age of candidates should be in between 18-23 years. Candidates belonging to the reserved categories shall be eligible for age relaxation as per Govt. Rules. Candidates should have passed Class 10th from a recognized Board.